We have two giveaways from Tommy Nelson during October along with a couple of other fun giveaways that I've been working on for a few weeks. Stick around and maybe pick up a few fun Christmas gifts before the real rush begins! 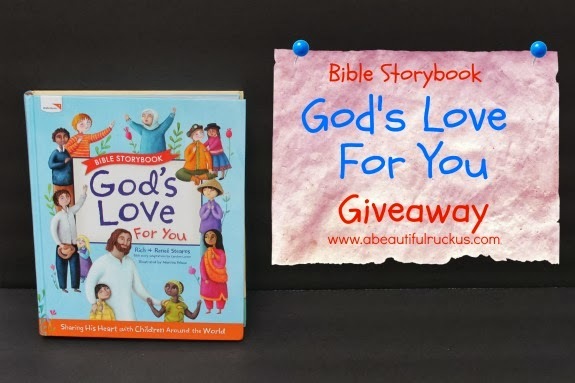 God's Love for You is a Bible Storybook put out by World Vision. World Vision does very similar things to what Compassion International does, so we really like the emphasis that they put on sponsoring and caring for children in poverty. Like many Bible storybooks, this one has Bible stories that are adapted for children to make them easier to understand. What makes it unique is that the Bible stories are interspersed with stories about current people who are experiencing similar situations to what we read about in the Bible. The two parts work together to bring the stories to life while encouraging children to understand and have compassion for those who aren't as fortunate as they are. The authors even thought so far as to include "Did You Know?" facts about the areas the stories refer to. For example, did you know that the world's largest mushroom grows in Zambia? It can grow up to three feet! World Vision has done a wonderful job creating a resource that parents can use to reinforce Bible stories, introduce their children to other cultures and living situation, and keep it all interesting the whole time! The God's Love for You Bible Storybook retails for $19.99. You can find it on Tommy Nelson or Amazon. Tommy Nelson is offering a copy of the God's Love for You Bible Storybook to one A Beautiful Ruckus reader. Please use the Rafflecopter widget below to enter. The first two tasks are not optional and must be completed to qualify for this giveaway. The additional entry tasks are optional. Winning entries will be validated prior to announcing the winner with an alternate drawn if the entries cannot be verified. The contest ends at 11:59pm on Wednesday, October 9th. The winner(s) will be randomly chosen and contacted by email on Thursday, October 10th. The winner(s) will have 48 hours to respond to the email with their information so that the prize can be forwarded to them. A Beautiful Ruckus is not responsible for the delivery of the prize and is not responsible if the sponsor does not deliver. This giveaway is open to residents of the United States. A Beautiful Ruckus received complimentary item(s) for review in exchange for hosting this giveaway from Tommy Nelson. No other compensation was provided. This post may contain affiliate links. For more info, please see my disclaimer page. I think the 'best' way that I have found to help children understand those who are different from them is to point out how God made each of us unique and we are ALL different. We may have the same hair color, but our eyes are different colors. We may all be able to walk, but maybe someone needs braces on their legs. I think that starting "close to home" and then branching out helps children to see that even those across the world from us or those who lived centuries ago are really not so different--because every one of us is special and unique. I make sure that he knows that even tho that he looks just like everyone else we are all not the same. He has 3 disabilities and while he plays like everyone else. They do not know what is wrong with him. We use lots of books. Also if there's someone they see that's different, I quickly explain to them it's not polite to stare and further explain why they're different. We send the kids' to schools/daycares that are multi-cultural, we attend cultural events whenever we can, and we make sure they know and include our entire family which includes several races, a few different disabilities and even a different language. I've helped my kids learn about other children that are different from them by attending different cultural events, spending time volunteering with refugee children, and we also have a few special needs family members and read books about together about differences and uniqueness. I try to teach my son that we are all different based upon God's principles. ;) I would love to add this book to my collection. By taking them on vacation with us. We took our twins to Canada when they were 2 and then to Germany/Austria/Hungary/Netherlands at 3. I had to explain that they were the ones that talked funny, not the other kids. Tickets are inexpensive now because no one has the money to travel. Amusement parks in other countries are free for age 4 and under. we talk about how people look different (from skin tones to height) even in our own family. We use the Bible stories where Jesus heals people to explain to the kids that some people can't see or hear or walk or talk. Their preschool teacher broke her foot and has a cast, so we've explained about different injuries and physical disabilities people can have. Also, some of the books we read together and shows we watch together show a lot of diversity and gives us a chance to talk about differences in our home rather than having them point and ask questions in public. My name is Jesse Roberts. I JUST did an activity with our preschool homeschool curriculum (Hands on Homeschooling) about how we should love everyone, no matter what they look like, because God made us all. I showed them a picture of children around the world. We looked at the differences. The main thing my almost 4 year old twins noticed was the hair color differences, and whether they were boys or girls. We talked about how all our hair/eye colors are different in our own family. Then, we did a hands on activity where we took different colored knee highs and put them on our arms. I pointed out how we were the same person, just a different color. It was a very simple lesson that they really understood. They also loved wearing the knee highs!